The McEachern Lady Indians improved to 3-0 with a 50-48 victory over defending class 6A champion Norcross this past weekend. Taylor Gordon led McEachern with 15 points, T’ea Cooper added 14 along with three steals and Caliya Robinson chipped in 11. Norcross (3-1) was led by Sierra Butler with 14 points and freshman Tylia Gillespie 10 (all in the first half). McEachern defeated Marietta the previous night 48-36 improving to 2-0 in region 4-6A. The Lady Indians (3-0; 2-0) will travel to Murfreesboro, TN to play in the Turkey Jam Tournament where they will take on No. 3 ranked team in the Max Preps Xcellent 25 Blackman (TN) (2-0). McEachern is ranked 20th. Defending 4A state champion Sandy Creek (11-0-1) will host Griffin (12-0) in the quarterfinals after winning the coin toss. This is easily a contest that could be a finals tilt yet the brackets were drawn how they were so they meet now. Sandy Creek’s tie came against Plant (FL) in the season opener. Plant (FL) is still alive in the Florida 8A playoffs. Of the eight remaining teams, Wayne County (3-4A), Alexander (5-4A), Carrollton (5-5A) and Stockbrige (4-4A) are not region champions. Region 5-5A has three of the final eight teams, Sandy Creek, Carrollton and Alexander, which all come from Division B of the region which is split into sub-regions. Below are the updated brackets and notes from some of the games. Sandy Creek is rounding into form as they have their full team in tact. Quarterback Cole Garvin passed for two touchdowns and did not throw an incomplete pass in the win over Chestatee. Damarre Kitt returned a punt for a touchdown and had a receiving touchdown while Eric Swinney rushed for three touchdowns. Jaquez Parks passed for two touchdowns and Devontae Freeman rushed for two touchdowns as Griffin advanced. Griffin will travel to Sandy Creek in the quarterfinals. Will Garrett passed for two touchdowns and Jarvis Terrell rushed for two touchdowns as Carrollton held off Monroe Area after trailing early in the game. Javon Brandon scored twice while Malik Bryan, Cam Maddox, Maetron Thomas added rushing touchdowns for Stockbridge in their shutout victory over Westover. Quarterback Chase Martenson rushed for three touchdowns and passed for another as Marist shutout Gilmer. Marist lost the coin toss with Burke County and will travel there for their quarterfinal meeting. Mikell Lands-Davis rushed for five touchdowns (three were 58 yards or longer) as Alexander advanced. Baylor Whitfield passed for a touchdown to Isaac Zico for Alexander’s other touchdown. Alexander, located in Douglas County, is 8-4 and in the midst of their best season since 1997. Tario Fuller rushed for three touchdowns for Lanier. Lanier posted a school record 9 wins in their fourth season, all under former Collins Hill head coach Billy Wells. Reginald Grubbs, Donquell Green and Donqual Young each rushed a touchdown as Burke County moved on. They will host Marist next after winning the coin toss. Mary Persons was held scoreless they final six quarters of this years playoffs. Malique Jackson rushed for two touchdowns and Krenwick Sanders returned a kickoff for a touchdown as Wayne County advanced to play Alexander in the quarterfinals. Wayne County has won 10 games in a season for the first time in 20 seasons. Logan Byrd passed for a touchdown and rushed for a touchdown for Veterans in defeat. Veterans finished their most successful season in school history with an 8-4 record. It was their first winning season and their first season winning more than four games in their four-year history. The final eight teams have been set in Georgia class 5A. Defending state champion Gainesville (Region 8-5A) is still in the field. Region winners Creekside (4-5A), Tucker (6-5A), North Paulding (5-5A), Warner Robins (2-5A), Kell (7-5A) and Ware County (3-5A) all remain. Mundy’s Mill (4-5A) is the lone team in the final eight that is not a region champion. Region 1 is the only region not represented in the final eight. Sophomore quarterback Felix Harper passed for three touchdowns as Creekside advanced to the quarterfinals. They will travel to North Paulding who won the coin toss for home field advantage. Warner Robins defeated Richmond Hill for the second consecutive season in the playoffs. Caden Johnston passed for two touchdowns, both to Marquez Callaway and rushed for a touchdown. Warner Robins scored two defensive touchdowns on a Callaway interception return and a Shamair Mitchell fumble return. Richmond Hill quarterback Nick Fitzgerald passed for three touchdowns. Chase Noonan passed for three touchdowns while Brandon Townsend returned two of his four interceptions for touchdowns as North Paulding defeated Stephenson. North Paulding will host Creekside next week. Ware County got two rushing touchdowns and a receiving touchdown from running back Dedrick Mills. Quarterback Jamar Johnson passed for two touchdowns and Rayquan Chatman returned an interception for a touchdown. Marcus Ivory passed for Northside-Warner Robins’ lone touchdown to Jurmon Weaver. Ware County will travel to Tucker next week. Gainesville advanced to the quarterfinals for the third consecutive season. DeShaun Watson passed for five touchdown and combined for over 500 yards of offense rushing and passing. Cameron Rosenthal passed for a two touchdowns while sophomore Evan Carnes caught a touchdown pass and returned an interception for a touchdown as Kell advances to the quarterfinals for the second time in four years. Randrecous Davis rushed for two touchdowns for Mays. Mays finished 9-3 in their first season under head coach Corey Jarvis after going 5-5 and missing the playoffs last season. Duke Shelley rushed for a touchdown and Erick Webber kicked three field goals as Tucker withstood a late East Paulding rally to advance. Mitchell Webb passed for a touchdown for East Paulding. Tucker will host Ware County as they won the coin toss. Mundy’s Mill advances to the quarterfinals for the first time in school history. The Tigers are 8-4 and the eight wins are a school record for wins and they continue to keep only their third winning season in history alive with the victory over Lee County. Three of the eight come from the loaded Region 7-6A (Gwinnett County), two from the respected Region 1-6A (South Georgia- Colquitt County and Lowndes), two from Region 4-6A (Cobb County-McEachern and Hillgrove) and one from Region 8-6A (Gwinnett County- Dacula). Norcross, North Gwinnett and Collins Hills all hail from Region 7-6A and finished in a three-way tie for the region title during the regular season, all were awarded pieces of the region title. Region 7-6A is 7-1 in the 6A playoff through two rounds. Region champions Lovejoy (2-6A), Langston Hughes (3-6A), Archer (8-6A), Alpharetta (6-6A), North Cobb (4-6A) and Camden County (1-6A) were knocked out in the second round. Region 5-6A champion Lassiter was the only region champion not to advance to the second round losing to Region 7-6A 4-seed Peachtree Ridge in the first round. Hillgrove, which pulled from McEachern in 2006 when they opened, scored 27 unanswered points after trailing 21-7 against Camden County to win 34-21. It was Hillgrove’s second playoff win at Camden County in the past four seasons. They lead the all-time series 2-1 (all in the playoffs, all in Kingsland,GA). Justin Denton returned a punt 82 yards for a touchdown and caught a touchdown pass. Hillgrove quarterback Elijah Ironside passed for two touchdowns-one a 72-yarder to Emanuel Beal. Omar Black caught a touchdown pass from Sonny Harrison. Kalvarez Bessent caught a touchdown while Harrison Poole and Antonio Wimbush rushed for a touchdown apiece for Camden County. Michael D’Angola kicked a 28-yard field goal with seven seconds remaining as North Gwinnett defeated Archer 34-32. He also connected on a 30-yard field goal in the game. Defensive tackle Dante Sawyer threw a touchdown pass, Hayden Sphire passed for two touchdowns-both to Caleb Scott and CJ Leggett scored a 39-yard rushing touchdown for North Gwinnett. Dylan Singleton rushed for two touchdowns and caught a touchdown while Gabe Tiller had three touchdown passes for Archer who finished with a school record 11 wins. Archer, in their fifth year of football, pulled from Grayson in 2009. 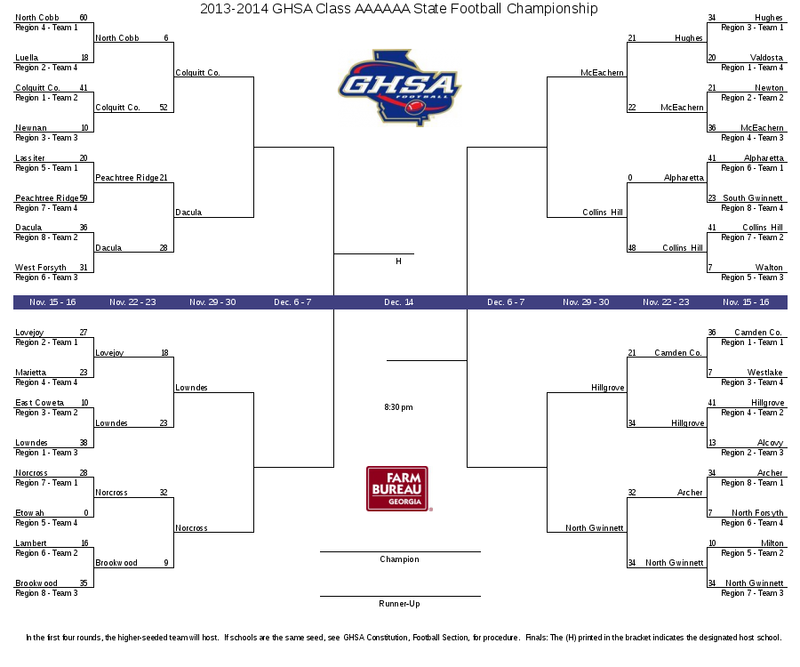 Grayson was the 2011 5A (highest class at the time) state champion did not make the playoffs this season. McEachern trailed 21-9 with less than six minutes to play before coming back to win 22-21 at Langston Hughes. Freshman quarterback Bailey Hockman passed for a touchdown, Taj Griffin and Alizee Chubbs rushed for touchdowns for the Indians. Hughes’ Keion Davis rushed for a touchdown and Kenny Moxey passed and rushed for touchdowns. McEachern advances to the quarterfinals for the first time since 1999 and are doing it without senior starting quarterback Ty Clemmons. Lowndes never trailed as they downed Lovejoy 23-18. Alex Brown and Jerome Daniels scored rushing touchdowns while Nick hart kicked three field goals for Lowndes. Preston Williams caught a touchdown pass, Jeremiah Kirkland scored a rushing touchdown and Brandon Williams scored a touchdown on a fumble recovery for Lovejoy. Lovejoy failed on all three PAT attempts. Lowndes will travel to north Georgia (Gwinnett County/Norcross) again next week to tussle with defending 6A champion Norcross. Collins Hill cruised past Alpharetta as Tyler Henderson rushed for two touchdowns and caught two touchdown passes. Quarterback Tyler Herman threw four touchdowns as Collins Hill has outscored their opponents 89-7 in the first two rounds of the playoffs. The Eagles will host McEachern in the quarterfinals. McEachern and Collins Hill have never met before. Dacula rallied from a 21-14 deficit to score 14 unanswered points in the second half to defeat Peachtree Ridge 28-21 to advance. Dacula quarterback Adam Grove passed for a touchdown and rushed for another in the third quarter while Bijan Sirleaf and Kelan Fraise rushed for a touchdown each in the first half. Chance Thrasher passed for two touchdowns and Myron Burton caught a touchdown and rushed for a touchdown. Dacula’s reward? They’ll host Colquitt County who is 12-3 under Rush Propst in road playoff games including Friday nights 52-6 thrashing of North Cobb. Colquitt County led 38-0 at the half and defeated North Cobb 52-6. Shihiem King rushed for three touchdowns and Tim Saunders rushed for two touchdowns. Daniel Mobley tossed a touchdown pass to Kiel Pollard for Colquitt County. North Cobb got a late touchdown pass by Tyler Queen to avoid the shutout. Colquitt County is now 12-3 in road playoff games under head coach Rush Propst (last five seasons). Colquitt will hit the road again to face Dacula. It will be the teams first meeting in history. For the second week in a row Norcross broke open a close game, this time to defeat Brookwood 32-9 after leading 7-3 at halftime. Norcross scored on five rushing touchdowns, two by Josh Boyd and one each by quarterback AJ Bush, wideout Clinton Lynch and KaDarius Garrett. Norcross was 1-5 on PATs in the game. Jesse Brown scored Brookwood’s lone touchdown via the ground. Norcross will host Lowndes in the quarterfinals in what will be the teams first meeting in history. Under first-year head coach Welton Coffey, Camden County book-ended their 10-2 season with losses to North Gwinnett and Hillgrove who will meet in the quarterfinals. The Coastal Georgia Wildcats from Kingsland were outscored 68-35 in those losses. Camden County has exited the playoffs with home losses the past four seasons (’10 Hillgrove, ’11 Colquitt County, ’12 Norcross and ’13 Hillgrove). Camden County has won 10 or more games the past 13 seasons and have never lost more than two games in a season during that span. Lovejoy’s losses came to Region 1-6A opponents Colquitt County and Lowndes by a combined nine points. Lovejoy is 0-3 against Region 1-6A teams the past two seasons. Lovejoy had made the state title game the past two seasons in two different classifications (4A and 6A). The McEachern Lady Indians shook off a sluggish start to win their season opener against defending region 4-6A champion North Cobb 71-48. North Cobb used a 6-0 run to take a 17-7 lead with 2:45 remaining in the first quarter. McEachern turned to their trademark pressure defense and uptempo style to finish the quarter on an 8-0 run and trailed 17-15 at the end of the quarter. Behind sophomore Jada Lewis McEachern continued their run opening the second quarter with seven quick points. Lewis nailed a three-pointer to give McEachern the lead 18-15 and followed it up with back-to-back lay-ups to cap a 15-0 run and McEachern never trailed again. McEachern continued to use its pressure defense to force turnovers to get easy fast break baskets while connecting on eight three-pointers in the game -four by Taylor Gordon, cruising to the 23 point victory as nine Lady Indians scored. T’ea Cooper lead all scorers with 23 points while Taylor Gordon added 17 and Lewis tallied 11. Kyrie Chandler was the lone Lady Warrior in double figures with 17 while Alexis Luster added 9. Up next for the Lady Indians (1-0) are road games at Marietta and Norcross before traveling to Nashville, TN to play in a Thanksgiving Weekend. In the boy games Freddie Brown scored 13 and Logan McIntosh chipped in 11 as McEachern pulled away in the second half outscoring North Cobb 37-18 in the half to defeat North Cobb 53-33. North Cobb did not have a double figure scorer as Noah Cotton had a team high 9. The first round is complete in Georgia 2A. 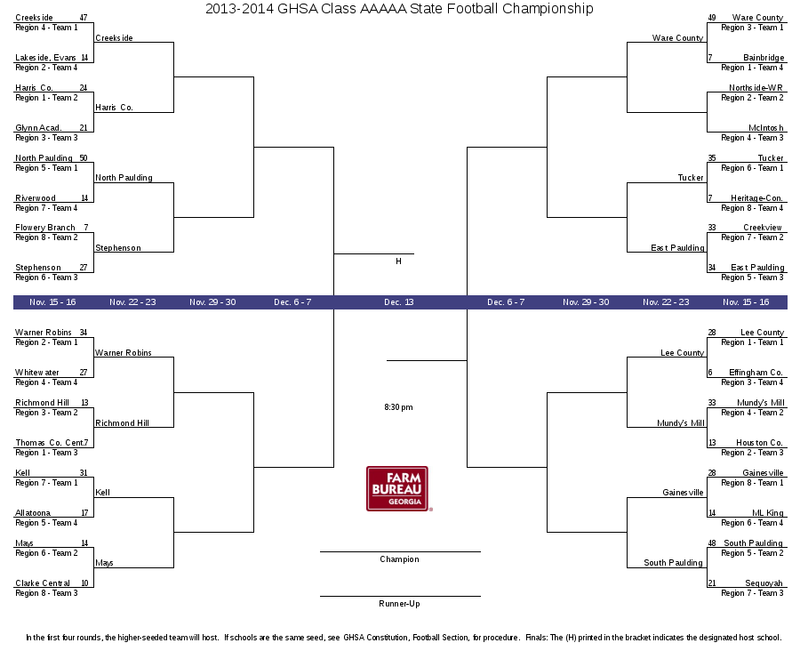 Below are the updated brackets and some notes from some of the games. Defending 2A state champion Jefferson advanced behind Tristen Jackson’s two touchdowns (one rushing and one receiving), Isaiah Blake scored twice on rushing touchdowns. Deandre Harris rushed for two touchdowns and passed for two touchdowns as Washington-Wilkes moved on. Chandler Curtis rushed for a touchdown and caught a touchdown pass while Cole Jackson had two rushing touchdowns for Calhoun. Lamar County has scored 50 or more points for the fourth time this season in a 58-15 victory. The Trojans are averaging 46.18 point per game this season through 11 games with 28 points being their only game under 40 points this season. Lamar County has not allowed an opponent to score more than 19 points (Northeast Macon) in a game this season. Fitzgerald advanced with a 41-21 win over Dublin on Saturday. Kendrick had rushing touchdowns by Triston Dowdell and Reno Lee. Rafe Chapple scored on two rushing touchdowns and passed for another while Micah Abernathy and Paul Carothers each had a rushing touchdown for Greater Atlanta Christian (GAC). Grant Haley, Jay Harris and Willie Candler each scored two touchdowns for Lovett. The first round is complete in Georgia 3A. Below are the updated brackets and some notes from some of the games. Keshawn Lowe and Tyler Gibson each had a rushing touchdown for Peach County. Defensing 3A champion Buford lead 35-0 at halftime. Josh Thomas scored a rushing touchdown and took back a fumble return for a touchdown as Buford shutout Sonoraville. Sonoraville entered the playoffs with a losing record. Cartersville’s Tiamon Pennymon rushed for two touchdowns in their victory. Veron Dasher rushed for two touchdowns while Maurice Paulk added a touchdown. Appling County also had a kickoff return for a touchdown by CJ Alexander in their win. Carver-Columbus’s Jawon Pass passed for three touchdowns and rushed for two as Carver-Columbus won in three overtimes. Eddie Culpepper rushed for three touchdowns and Terry Goodwin returned a punt for a touchdown for Callaway. Terry Googer passed for two touchdowns while Elijah Holyfield rushed for three touchdowns as Woodward Academy advanced. St. Pius X won at Hart County. Joey Conners had two rushing touchdowns in the contest. Dalton Whitefield rushed for three touchdowns as White County advanced. Maurice Sutton also rushed for two touchdowns. The Byrnes Rebels have put up a multitude of points this season behind record-setting quarterback Shuler Bentley. The Senior has passed for 58 touchdown this season entering their first round playoff game in South Carolina’s 4A-Division 1 playoffs. Bentley would add five more to his total as Byrnes defeated Wando advancing to the second round. Running back Najee Bowens caught three touchdown passes of 47, 82 and 33 yards while receivers Shaedon Meadors and Tavin Richcardson each caught a touchdown. Byrnes’ defense scored on a 22-yard interception return by Jared Davis. Byrnes trailed 6-0 early before running off 28 unanswered points for a 28-6 advantage at the end of the first quarter. The Rebels will host Lexington next Friday in the second round. Boiling Springs ended Gaffney’s 41 game home playoff winning streak with a 48-41 win. Gaffney’s Hyleck Foster rushed for over 200 yards and scored four touchdowns but it was not enough for the Indians. Boiling Springs advances to play Summerville in the second round. 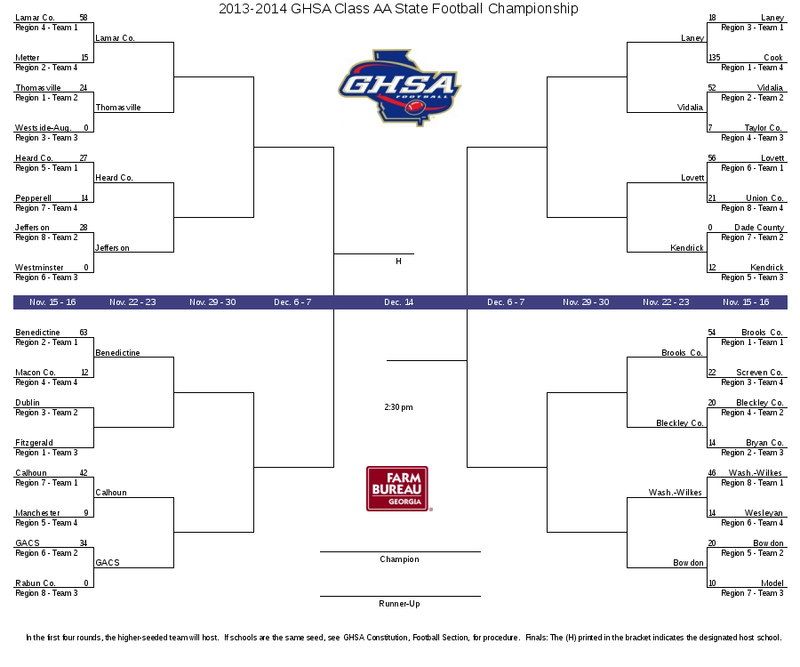 The first round is complete in Georgia 4A. Below are the updated brackets and some notes from some of the games. Sandy Creek, the heavy favorite, shut down Cedartown and star running back Nick Chubb. Javon Jackson returned a kickoff for a touchdown, Delvin Weems had three rushing touchdowns and his counterpart Eric Swinney rushed for a touchdown and caught two touchdown passes as Sandy Creek eliminated Cedartown holding Chubb under 80 yards rushing. Cole Garvin hit Demarre Kitt for a touchdown pass for Sandy Creek. Stockbridge advanced behind their well-known defense while getting two rushing touchdowns from Maetron Thomas. Carrollton returned an interception for a touchdown in their 52-10 win over Northwest Whitfield. NW Whitefield was outscored 52-3 after opening the game with a kickoff return for a touchdown. Veterans’ Logan Byrd passed for a touchdown to Keone Pearson, and rushed for another. Pearson also had a rushing touchdown as Veterans won their first ever playoff game. Veterans racked up more than 450 yards of total offense. Tyler Seller passed for two touchdowns for Locust Grove in defeat. Mary Persons recorded a safety and intercepted a late pass to seal their 16-14 victory. Both Eagles Landing touchdowns came on Bradley Dewberry passes. Marist, a heavy rushing team, had two passing touchdowns in their 41-13 win. Alexander won a game winning field goal as time expired. Griffin remained undefeated with a shutout win over Rutland. Malik Miller and Telly Sloan each scored two touchdowns apiece. The first round is complete in Georgia 5A. Below are the updated brackets and some notes from some of the games. Deshaun Watson lead Gainesville past ML King with a 28-14 victory. Watson is Georgia’s all-time leading passer but was held to 23 yards passing in the game but rushed for two touchdowns. Quarterback Roland Rivers rushed for two touchdowns for ML King. Harris County had touchdwons runs by TaQuon Marshall and Esias Chapman as well as an interception returned for a touchdown by AJ Howard. Dallas Rivers scored two rushing touchdowns as Stephenson defeated Flowery Branch. Khalil Ladler returned an interception for a touchdown and Stephenson’s defense did not allow a Flowery Branch touchdown until it was 27-0 with under three minutes remaining in the fourth quarter. Flowery Branch was held under 200 yards of total offense. Mays blocked a field goal and standout recruit Natrez Patrick returned it 75 yards for a touchdown. Sophomore Randercous Davis scored on a short touchdown run in the fourth quarter to defeat Clarke Central. Clarke Central’s lone touchdown came via their Johnson & Johnson connection as Cameron Johnson hit Austin Johnson for a touchdown pass. The Mays defense held Clarke Central on a fourth down play inside the Mays five to seal the win. Kell’s number two quarterback Cameron Rosendahl passed for two touchdowns. Julian Burris and Dyllen Reed added touchdown runs as Kell advanced. Allatoona star running back Joshua Bettistea was held without a touchdown. Richmond Hill stopped Thomas County Central on a late fourth down and ran out the clock for the win. Creekside trailed at the half against an improving Lakeside-Evans program but busted it open in the second half for the blowout victory. Creekside remains undefeated this season. Northside-Warner Robins scored 17 unanswered points int he fourth quarter to pull out a 31-21 win over McIntosh. Wille Jordan rushed for two touchdowns, Marcus Ivory passed for a touchdown and Jurmon Weaver caught a touchdown pass from Glenn Smith on a double pass for Northside-Warner Robins. Caden Johnson passed for three touchdowns and rushed for another as Warner Robins defeated Whitewater. Whitewater scored three of their four touchdowns on the ground. Rodney Smith rushed for four touchdown to lead Mundy’s Mill past Houston County, three of his touchdowns came in the opening quarter. Tucker scored on at least two touchdown passes in their win over Heritage-Conyers. ‘Duke’ Shelley returned the opening kickoff for a touchdown.